Fanny Bay Oyster Bar brings the freshest BC shellfish to your special event. 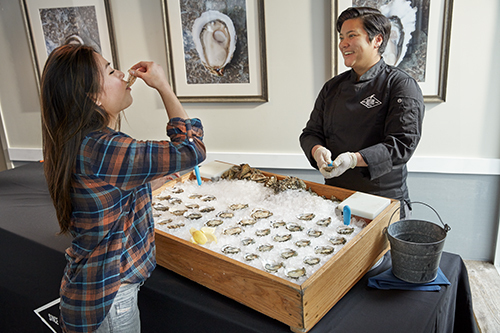 Our catering stations are “mobile oyster bars” that can stand alone at weddings, birthdays, barbecues, corporate events, holiday parties, and any other occasion that calls for unforgettable catering services. Treat your event guests to the finest shellfish in British Columbia, as well as the most knowledgeable and personable shuckers around. Our expert shuckers not only open oysters for your guests, they also arrive with an extensive background in the region’s history, geography, and the entire Fanny Bay Oysters process, from tide to table. Contact us at TommasoV@fannybayoysters.com or call 778.379.9512 for inquries.